Still waters and cloud in Eryri. Last week, the sun shone endlessly, and I was finally able to get away from domestic commitments on Thursday afternoon. It was my intention to “do Snowdon” on Friday so I parked up overnight by the Llynnau Mymbyr near Capel Curig. Dawn was frosty and valley fog had formed overnight. The forecast was for a day of unbroken sunshine and light winds. While it would be lovely in the mountains I suspected that conditions would not be that great for atmospheric landscapes. 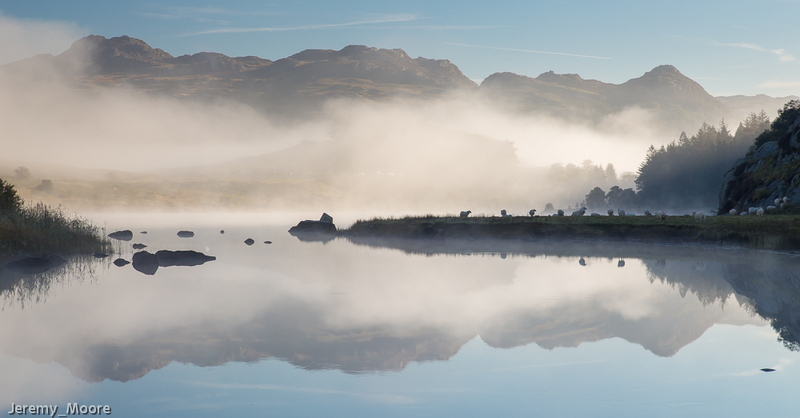 Flexibility is the name of the game in landscape photography so it was over to plan B, which involved an early morning session in Dyffryn Mymbyr as the fog cleared. Sunrise comes so late at this time of year that it was a really leisurely start! Llyn Mymbyr is one of the classic photographic locations in the National Park. The view from Plas-y-Brenin of the Snowdon Horseshoe reflected in the lake’s still waters is often the photographers’ desire. It is quite iconic in good conditions and when done well. But in valley fog one would be immersed in damp greyness and Snowdon would be quite invisible. It is then more profitable to take the rough and tussocky path between the two sections of the lake and look back towards Plas-y-Brenin. It is one of my very favourite locations in Wales. As the sun rises the fog tends to melt away downstream, allowing more and more of the landscape to emerge. Friday morning was just about as good as it gets, as you can see from the image above. The sun shone all day on Friday and the Horseshoe looked absolutely stunning during the afternoon from Dyffryn Mymbyr. But I was glad that I had saved my energy for an attempt on Snowdon the following day. Saturday’s forecast seemed much more promising; a broken cloud base of perhaps 500 – 600 metres but with the summits remaining above the cloud. I liked the sound of that! The next morning the fog was denser and more extensive at Capel Curig but stars could still be seen overhead. By the time I set out from Pen-y-pass about 7 a.m. the first wisps of cloud were forming above Y Lliwedd, and as I made my way up and along the PyG track I barely noticed how quickly it was developing. I’m nowhere near as fit as I used to be and I don’t mind admitting that it was a bit of a slog to reach Bwlch Glas. At this point one leaves the confines of the great eastern corrie of Yr Wyddfa and can take in the view to the west. An almost complete sea of cloud spread out below me. It was more or less only within the corrie and above the very highest peaks that cloud had not already formed. Blue sky could still be seen over the summit of Snowdon while cloud lapped and drifted around below it. I grabbed a quick vat of tea from the café and assessed the possibilities. I was a little disappointed about the extent of the cloud but these were ideal conditions for seeing a Brocken Spectre. I walked around the summit area to find the best location and for an hour or so one was visible intermittently as my shadow was projected on to cloud below. The shadow itself was astonishingly three-dimensional as it fell on to countless tiny individual water droplets. The Spectre – or Glory – takes the form of a small circular spectrum of light centred on one’s own head. It has all the colours of the rainbow, and is, in fact, formed in a similar way, with violet on the inside and red on the outside. At times, the colours in the Glory just glowed. I have enhanced the colours slightly in the image above but it still retains a close link with reality. And interestingly, if one enhances it further, additional concentric rings of colour can be seen outside the primary spectrum. For a while it was truly glorious up on the summit. It was warm and there was barely a breath of wind, just enough to cause the cloud to drift slowly around. A continuous stream of people were arriving by mid-morning. Every train brought another few dozen, but on such a day far more were doing it on foot. Conversations could easily be overheard. English seemed to be a minority language! Was that Welsh…..? Er….no, probably Polish. A few fully bearded Muslim men had walked up and even a few veiled Muslim women. 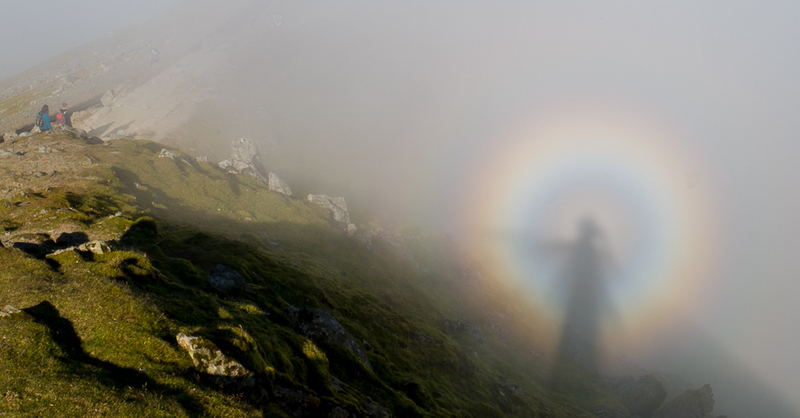 But it was apparent that few had actually noticed the Brocken Spectre, even if they were only a few feet away from a good viewing point. Occasionally one could hear the magic words being spoken, and it was a pleasure to join these individuals in the experience. Well, all good things must come to an end. The cloud base was lifting imperceptively until it was clear of the summit by lunch-time. Beneath the cloud it was dull and hazy so it was time to put the camera away and return to Pen-y-Pass. Still the crowds were flooding upwards, though. Little did they realise what they had missed. This entry was posted in Uncategorized and tagged brocken, Capel Curig, glory, landscape, landscape photography;, llyn, Llynnau, Mymbyr, outdoor photography, Snowdon, snowdonia, Spectre. Bookmark the permalink. 3 Responses to Still waters and cloud in Eryri. The wonders of nature! I’m seriously impressed, Jerry. While I’m pleased with the Brocken spectre image, on the Snowdon walk I was continually frustrated by having to use the Panasonic GX7. Conditions were warm and humid, I was sweating, my glasses were steamed up and I was using this little toy camera! Just to warn you if you’re still thinking of buying something smaller; the experience of using one is very poor compared to a SLR! I’m one of those people that takes ages when it comes to a purchase. I read too many reviews and then something new comes along and the review process starts again! I won’t be giving up on an SLR though, whatever happens.